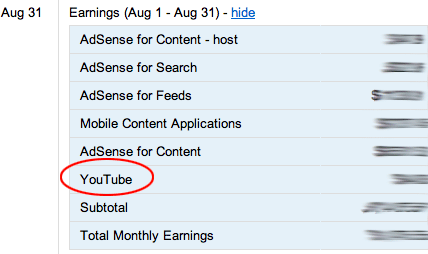 There has always been complaints about how YouTube AdSense earnings are represented in the AdSense reports. The issue is, the earnings publishers make from their videos are always delayed and thus do not show up on the daily reports. This question was just recently brought up again in the Google AdSense Help forums based on Google announcing they are retiring the old interface. YouTube earnings are visible in the payment history of the new interface. You should see the same number as in the old interface in one of the two line items on each month, under the "YouTube" label visible after clicking "details". It's difficult to do better, because YouTube earnings are available only on a monthly basis to AdSense, while the new interface is designed for more granular data (daily). Previous story: Google Mixes Up Exchange Rate For Canadian AdSense Publishers?